Through luncheons with senior leaders as guest speakers, i.e., Purposeful Leadership Speaker Series, Workforce Ministries endeavors to provide a variety of speaker experiences that can enhance an individual's spiritual life, answer questions for seekers, and provide a community of believers for support. It is to this end that Workforce Ministries strives to transform the lives of men and women in the workplace, and thereby the marketplace for Christ. In addition to our Purposeful Leadership Speaker Series, Workforce Ministries serves as a resource to help link Christians in the workplace, i.e., through our ministry partners, to the Christian community at-large. Challenge believers to take their faith to work, engage with others in a Christ-like manner, create a faith-friendly work environment, and be a witness for Jesus. Create and attend small group Bible studies focused on the workplace. Reach out to seekers with gentleness and respect, and be ready to lead them to Christ. Hold regular events where Christians from the workplace can gather to fellowship with one another and hear an engaging presentation relevant to the workplace. 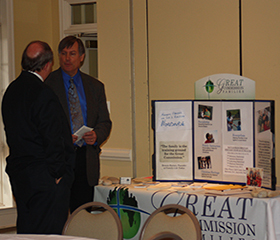 Workforce Ministries strives to deliver a variety of experiences that can enhance an individual's spiritual life, answer questions for seekers, and make available a community of believers for support. To learn more about upcoming events sponsored by our partners please click here.